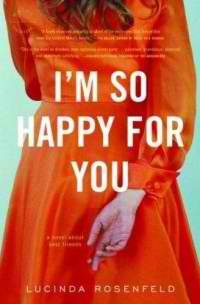 I'm So Happy For You: A Novel About Best Friends is Lucinda Rosenfeld 's third novel. Wendy and Daphne are in their mid-thirties and have been friends for years. Wendy is well-established in her career, happily married, and trying desperately to have a baby, whereas Daphne is often reckless, dramatic and frequently experiences life mishaps. When Daphne suddenly stumbles into a seemlingly perfect lifetsyle with a rich, handsome husband, a new home, and a new baby on the way, jealousy consumes Wendy and she soon becomes obsessed trying to validate the components that make her own life special. Reading the synopsis, one would think they've got this plot figured out. After all, the chick-lit formula usually involves a number of silly, humorous cat-fights, embarassing situations, and a perfectly happy ending in which the two women embrace and confess their undying friendship, right? WRONG! Not in I'm So Happy For You , and that's exactly why I love this novel! Rosenfeld tells a great story most women will relate to about battling pent-up frustrations regarding competing for who has "the better life". If you've never had this type of experience with a female friend, maybe you've had a similar competition with a sibling, or your own mother or step-mother. Wendy's desperation to prove herself is endearing, no matter how disastrous it is at times throughout the novel. I'm So Happy For You isn't predictable either, which is another spectacular bonus! Seasoned readers will not forsee the outcome, and this is why you'll appreciate it much more when you finish. I'm So Happy For You sends a well-known message along the lines of "the grass always appears greener on the other side". Lucinda Rosenfeld 's other novels are What She Saw (2001) and Why She Went Home (2004).